Woking have stretched their winning run in the Vanarama National League South to six straight games thanks to a goal in either half against a struggling Eastbourne Borough for a perfect end to 2018. A second-minute Toby Edser goal gave the Cards the early advantage, with a fortunate own goal midway through the second half making the game comfortable, to see Alan Dowson guide his team to six consecutive league victories – the first time Woking have achieved the feat since April 2014. Dowson made one change to his starting line-up which secured the Boxing Day home win against Hampton and Richmond Borough with loan signing Aaron Eyoma coming in for Max Kretzschmar on the right side of the attack. Mild and dry conditions greeted a strong Kingfield crowd, with the FA Cup also in attendance before kick off ahead the Cards’ next home match against Watford in the 3rd round of the famous competition. 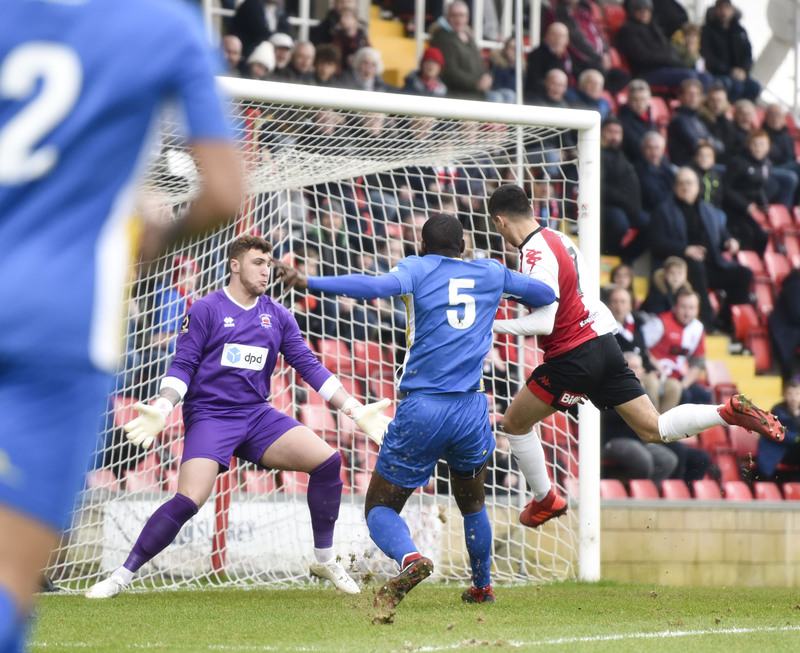 FA Cup distractions aside, Woking continued their strong league momentum by taking the lead inside two minutes through Edser’s close-range finish for his fourth goal of the season. After quick interplay on the left wing, Jake Hyde’s cross found Edser whose control and shot inside the six-yard box gave goalkeeper Mark Smith no chance. Despite being on a run of four consecutive defeats in all competitions, the Sports showed glimpses of their good form from the start of the season after going behind. The visiting team found space with Joel Rollison’s link-up play with the forwards and on 20 minutes had their first clear-cut chance to equalise as Rollison cutback smartly to Dean Cox only for the striker to blaze his shot over the crossbar from 12 yards. Woking threatened a second as Edser evaded an offside trap to sprint clear only for his cute lay-off to be sliced wide by Harry Taylor’s shot. The Cards ended the first half the stronger, going closest through a Ben Gerring header which darted wide, but did take a deserved lead into the interval. With Woking attacking a vocal Kingfield Road Terrace, the home side kept on the front foot with Ryan Hall being caught in possession to see the ball fall to Loza who fed Jake Hyde but on his left foot the forward fired just over the crossbar from 12 yards out. Woking’s second goal duly came, albeit in unlikely circumstances, as a long punt forward from Craig Ross was allowed to bounce over the Eastbourne defenders. Tom Gardiner rushed a header to see the ball loop over his onrushing goalkeeper Smith, who was caught in no-man’s land, allowing the ball to find the net. Credit to the visitors was due as the second goal failed to deflate their intent and continued to ask questions of Woking’s backline which remained resolute with cover from Jolley and Taylor. With Eastbourne pushing to get back into the contest it provided more space for counterattacks with Hyde having two efforts; the first blocked out and the second flashed wide despite substitute Paul Hodges’ best attempt to divert it into the goal. Entering the final 15 minutes Woking’s other two substitutes also went close to a third as Nicky Wheeler cut on to his right to produce a curling effort which could only be palmed out to Noel Leighton but the youngster didn’t adjust his fee to poke the ball on target. Persistent work down the left flank by Wheeler continued to offer Woking the chance for a third goal, with the best effort seeing Gerring head just past the far post. Despite not finding a third Woking ended the game comfortable winners to round out a happy end to the year. Man of the Match: Toby Edser for his early goal and control of the midfield throughout the match.